Quite how Canadian Brian Ahern got signed to Verve is unknown. They even allowed him to produce and arrange these records. So I'm almost certain that Chapter V were a studio creation consisting of Ahern plus an assortment of Verve sessionmen. According to the Verve archives three songs were recorded by Chapter V at their studios in New York City on the 17th February 1967. This may explain how one of the songs 'Dolly's Magic' was used as a flip twice. 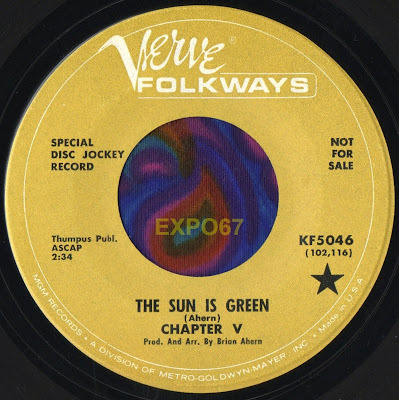 'The Sun Is Green' is a classic slice of pop psych with a very strong Beatles influence with it's Lennonesque song structure circa Revolver era. 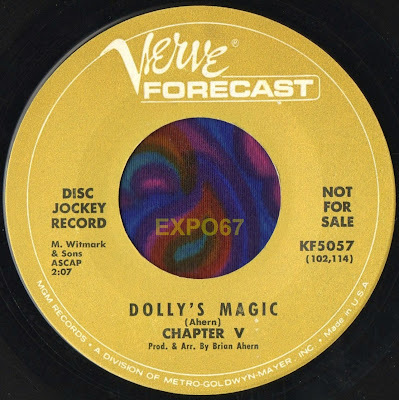 'Dolly's Magic' has a bouncy bass rhythm with some sweet harmonies and would have made a commercial A-side in it's own right. Another single was also released by Chapter V again backed with 'Dolly's Magic'....This time around 'Headshrinker' got it's chance but it doesn't appear to have done any better than 'The Sun Is Green'. After these recordings with Verve, Brian Ahern relocated to Nashville and became a much rated producer of country records.